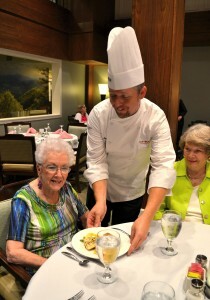 Grace Ridge Executive Chef Jeremiah Brown and his culinary team are dedicated to smashing misconceptions about bland retirement community food: one roasted shallot and mushroom flan, sake and ginger glazed salmon, and mango sorbet with green tea whipped cream at a time. Tasty, creative and visually appealing cuisine is a big slice of the Good Moods at Grace Ridge pie, which means there’s no plopping a scoop of cold mashed potatoes on a plate or serving mass-produced and perfectly shaped loaves of chicken cordon bleu. For National Nutrition Month, the culinary team will embrace the “Savor the Flavor of Eating Right” theme by featuring new recipes focused on fruit, veggies, whole grains, herbs and spices. Also planned is a Chef’s Table to highlight featured ingredients and test residents’ ability to identify different greens, grains, legumes and herbs. Additionally, Grace Ridge is partnering with Western Piedmont Community College to build an herb garden in the spring. “It’s about getting people to think about what they’re eating and giving more thought to where their food comes from and what it does for them. That’s what we’re here for – to help them make those changes,” Brown said. While the culinary team won’t be converting mac and cheese enthusiasts to eating solely tofu and salads, they do enable residents to make healthier decisions. Sometimes, positive changes are slow to boil and must first start with a familiar ingredient before gradually sprinkling in a lesser-known one. One such example, Brown said, is the mushroom meatloaf. It used to be made mostly of beef with just a bit of turkey, but over time it shifted to a 75-percent turkey and 25-percent beef ratio. 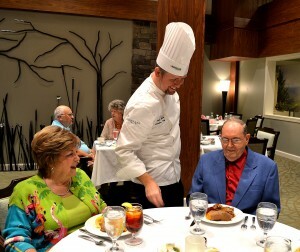 Encouraging residents to step outside their culinary comfort zone is also essential. When Brown first joined Grace Ridge three years ago, he never would have imagined making something unfamiliar like southwestern black bean quinoa salad. “I’ve noticed our residents have a lot more faith in us and when they see a new item, they will try it,” he said. That trust comes from the relationship the Grace Ridge staff has cultivated with its 200-plus dining room regulars and the level of service that comes with living there – whether it’s making a special bowl of mixed fruit for the resident with a pineapple allergy, adding gluten-free items or always thinking of ways to enhance the role good food plays in their lives. Case in point: The Chef’s Showcase event on March 18 will feature an eclectic menu of items sourced within 100 miles: vegetables from Bluebird Farm, meats from Rock House Farm, microbrews from Fonta Flora, fish from Buck Creek Trout Farm and other items from farmers markets in Morganton, Hickory and Asheville. Previously referred to as Fine Dining at Grace Ridge, the popular monthly event was renamed Chef’s Showcase to broaden the theme, make the evening less formal and focus more on the Good Moods experience.